The 13th amendment abolishes slavery except for the punishment of crimes; effectively making ANYONE inside a prison complex a slave to the United States of America. The 13th amendment effectively ended the privatization of the human flesh trade and brought it under federal oversight. 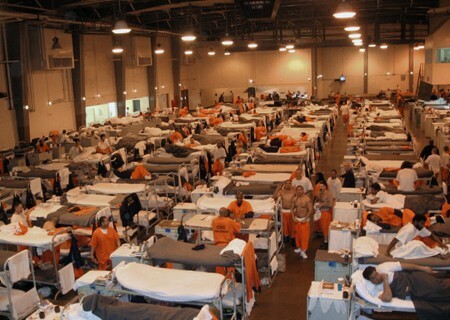 Now they call it fancy names like “mass incarceration” and the “prison industrial complex” – for the many people that pass through those walls, it is a combination of slavery and sharecropping, 21st century style. And we the American public – especially Black people (who make up the largest percentage of “new slaves” in prison), gleefully support the insidious institution knowingly, while feigning ignorance. Don’t believe me? Wal-Mart : They REALLY take it back to the plantation days of old, having prisoners, work the produce field (just like cotton fields – now known as prison farms) sun up to sun down for pennies a day. Aramark : Yes.. the food truck that supplies your precious Timmy with lunch at school… controls the food service in the majority if the US prisons. They figure it is helpful if little DeShawn & Timmy grows up with prison food – they are trying to train them early. BP : Guess who cleaned up that oil spill? You guessed it Black inmates. Exclusively. No pay, No protection from the chemicals… just a hearty “go clean that shyt up”. the propaganda you saw on TV of them hiring residents and the like was just that… propaganda. No sane person, under his own will, is going to clean up toxic waste – even WITH protective gear. Fidelity Investments : Got a 401k? you might want to check your options. The company invests heavily in prison labor and provides massive returns to investors. So all you corporate Black folk who are proud of our retirement plans should know that (depending on your options) you are banking your retirement on slavery..in 2015…on the backs of your people. The irony is, the majority of companies listed above are STAPLES in the Black community. See how that works? We are supporting the enslavement of our own people. Millions of jobs that could be given to help keep our young men and women off the street are only waiting for them if they sign their freedom away. Signing ones freedom away is inevitable, if one doesn’t have a way to financially support himself or his family. Black people are living in a perpetual catch 22 and are doing nothing to change it. We can’t claim ignorance anymore. So know that it has been laid out for you bare – in plain English… what will you do? Will you put your finances BACK into your communities and create jobs and resources akin to BEFORE integration? Or will you willingly participate in your own financial genocide? …is this even legal? Dàmn!